An example of how Asset Bank’s DAM system can be adapted for other uses. One of Asset Bank’s key strengths as a Digital Asset Management system is that it can easily be configured to suit an organisation’s particular needs. Illustrating this is a website we designed for Ingfield Riding Group, a charity that provides horse riding sessions for disabled children. This is an organisation close to our heart as the daughter of Asset Bank director Martin loves attending the sessions. 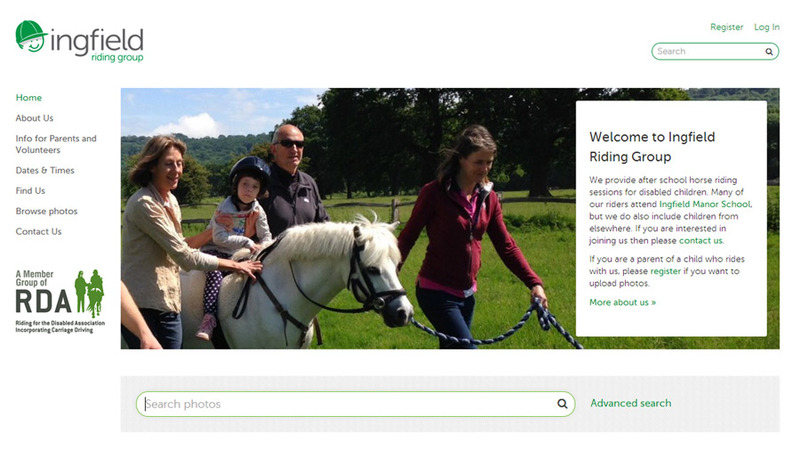 Ingfield Riding Group wanted a new website that would allow them to provide information about their service to parents and carers, but also a tool that would make it easy for volunteers and parents to upload photos of the sessions. As you can see below it was simple for us to configure the Asset Bank front-end into a simple, easy to use website with built-in content management capabilities. This is just one example of how Asset Bank can be adapted to suit requirements that at first glance may not seem related to ‘Digital Asset Management’. The fact is that almost all websites and web applications these days need to provide functionality to support images and videos, to a varying degree of complexity. Using Asset Bank’s Digital Asset Management software as a starting block means we can develop a variety of media-rich applications quickly and often at a great price. If you have such a project in mind please do get in touch for a free quote now.